At a recent tech industry trade show, I came across the company Toast, and Matias Brecher. I vaguely remembered a Kickstarter campaign from 2012 with the project being a slim wooden case for smartphones. That was Matias Brecher’s, and the Kickstarter funding was a success. With the amount of tech news I take in on a daily basis, I forgot about Toast. So when I finally saw the wooden case in person at the trade show, the fit and finish, I knew I had to try one. 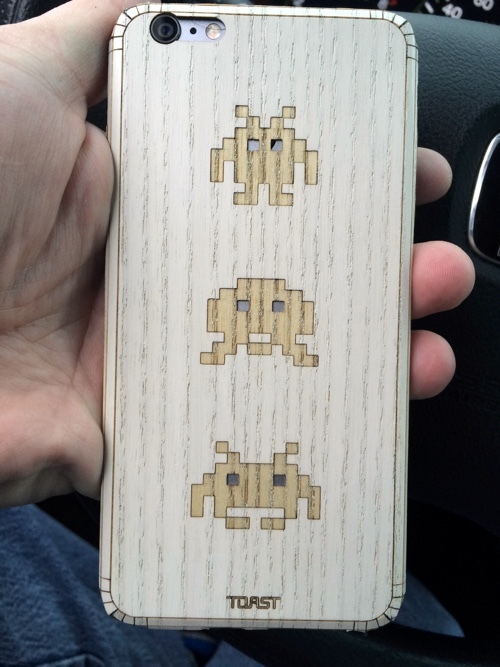 The one in question is the 8-Bit design for my iPhone 6 Plus. 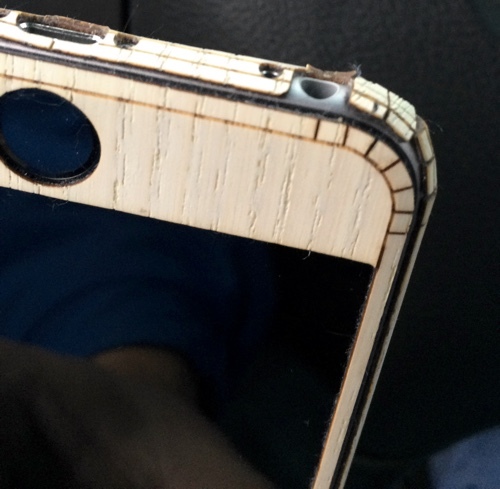 The wood, or more accurately the wooden veneer, is affixed to the iPhone via an adhesive back. It sticks very well, and when removed, does not leave any nasty residue. 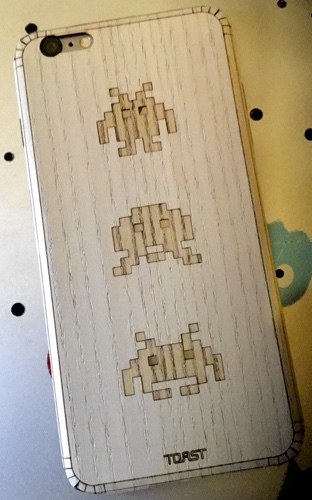 As a child of the 70s and 80s, the 8-Bit Space Invaders etched backing was a passionate choice for design to me. Toast has a lot of different designs, and you can even have them create a custom design, such as your company logo. Installing the Toast Case on a iPhone 5 or 5S would be much more simple than on the iPhone 6 or 6 Plus. Installation of the wood veneer onto my iPhone 6 Plus was both difficult to master and unforgiving at the same time. Because the 3M adhesive is so sticky, and it is a one-and-done (once you remove the case, it’s worthless and cannot be used again), if you make a major mistake in installing it, well, too bad. I almost made an alignment mistake, following their very well written instructions that were included. Happily, I recovered just in time and saved the case. Still, it took me around fifteen minutes to install the front and back of the Toast case, although ninety percent of that time was on the back. The front was very simple. Because the new iPhones have a beveled edge, the Toast cases for these phones use fan-like cuts to follow the curvature of the phone, including the edge and corners. This is where the problems started. The Toast case is VERY thin veneer by design, as it should be. Because of this, on the corners that are pre-cut, there are only very slim pieces of veneer, and with the precise laser cuts to the veneer, the edges are both sharp and likely to snag on things. 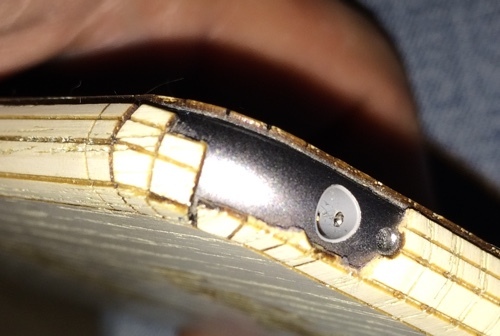 Some string inside the front pocket of my jeans snagged a corner of the Toast case, and when I pulled the iPhone out, the corner came unstuck. Afterwards, it would peel away from the iPhone. Eventually, that piece broke off completely. Another piece broke off when someone slid a coffee mug that crashed into my iPhone. They didn’t toss it or anything; just a gentle slide of the cup that hit the corner of the iPhone. But it was enough for that piece of thin veneer to break off the rest of the case. 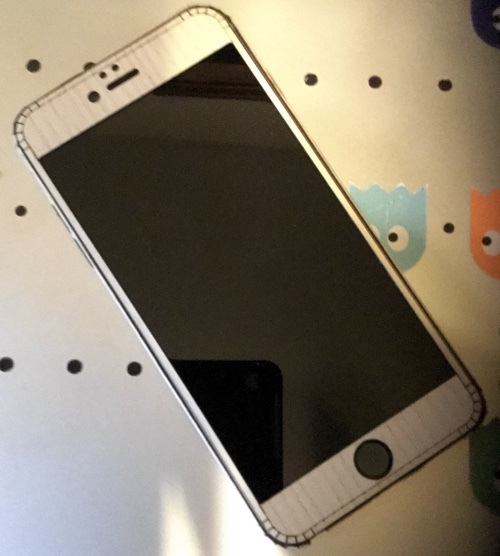 The Toast Wood veneer case is not about protection, it is about esthetics. And in that regard, there are very few iPhone or Android cases as attractive and eye catching as are these Toast cases. They are absolutely beautiful. The fit and finish are second to none. On a personal level, I like the people at Toast, and typically find myself rooting for a small company to succeed. 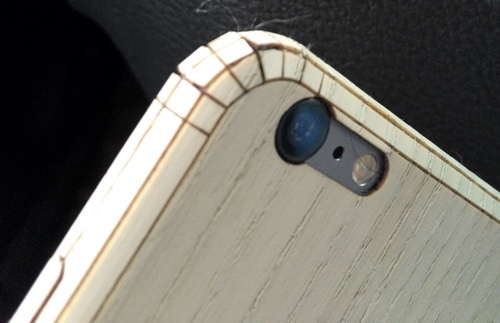 On a more straight backed phone, such as the iPhone 5S, these types of custom wood cases work great. On a curved iPhone, such as my 6 Plus, not so much. I love the feel of the continuous glass front of the iPhone 6 Plus all the way to the side. With this case, that feel is gone, replaced by a very sharp edge of wood. You can buy the front or back of the Toast case separately, and they come in a variety of different wood veneers. All of them are extremely attractive, and they are made by great people. But on the iPhone 6 or 6 Plus, there are some issues that need to be worked out before I can recommend it for daily use.